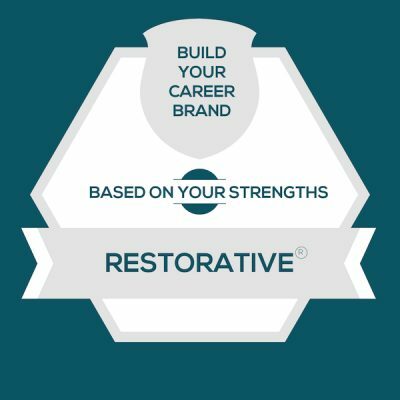 I get gobs of questions about how to align your CliftonStrengths talent theme of Restorative with your career. So in this series, I break down one strength per post so that you can add to the insights from your StrengthsFinder report and make a better match between your job and your strengths. – If you’re exploring as a manager, use this series for career development ideas and even new clues about responsibilities you could give a person with this talent theme so that they can show up at their best. – If you’re exploring for yourself, use this as a chance to build a reputation for your strengths so that you’re more likely to be given assignments that live in your strengths zone. Today, the talent theme of the post is Restorative. You probably already have a reputation for what you know. If you imagine your resume or your LinkedIn profile, I bet it’s full of “the what,” which are things like job titles, skills, knowledge, expertise, or the degree you earned. Now, what’s missing in most of them is “the how,” and this is where your StrengthsFinder talent themes live. This is an overlooked use for LinkedIn, which is not just for job seekers. I bet you are just like my StrengthsFinder training clients, where you don’t see your teammates and customers every day. That’s why LinkedIn has become so important for career branding. It’s how your teammates, customers, and vendors go look you up before a meeting – to see who they’re about to talk to. And rather than only telling them what you know, you should also give them a peek at how it is to work with you. These are the cultures, interactions, or situations that feel like soul-sucking drudgery to someone with the talent theme of Restorative. They might even make you want to quit the team. So I’ll give you a couple of these to be on watch for — because if they fester, you might get the urge to quit the job or become detached and disengaged at work. False Harmony. If you lead through Restorative and you have a team culture where people are outwardly harmonious (when they don’t actually agree) — where they fake their agreement and go through great lengths to be conflict avoidant, you will probably feel super drained by that. Sweeping Issues Under the Rug. If you keep getting responses to your problem-solving ideas that sound like, “Well that’s not really something we own” or “That will never work here” or “No one else seems worried about it, so let’s not make mountains out of molehills” — you will be soul-sucked because you’re around people who are ignoring problems that you’d be happy to solve. These are ways to apply the talent theme of Restorative at work, even when the job duties on the team feel pretty locked in. If you’re listening as a team manager, be sure to have a conversation around these ideas. You’ll both be able to come up with places to apply them. Give them your big, hairy problems. Many managers feel bad delegating problems. Yet problems are a treat for people who lead through Restorative. Tell them why you assigned them, and that you know they’ll be able to diagnose and propose at a level that few people can do. Get them assigned to solving problems for your best or biggest customers. This person will enjoy the challenge of discovering and removing the obstacles. You can rest assured that they’ll go about it in a businesslike, focused way (rather than the emotional panic that many would get into). When you’re stuck. When you catch anyone on the team saying, “I’m stumped” or “I’m baffled” or “I don’t know what to do” — consider partnering them with your team member with Restorative. This person has fun finding the root causes and helping people decide how to move forward.